Horner, Carl. In the early 1900s Horner's stoic, some will say bland, portraits of Major League Baseball players were commonly reprinted by newspapers, magazines, board games and trading cards. He shot what is one of the most recognizable images in the history of the American sport: the portrait of Honus Wagner used on the 1909 T206 card. While reproductions of his images are common, Horner's original mounted photographs are rare and highly desired. He produced a number of hen's teeth rare and extremely expensive cabinet cards with T206 portraits (same portraits as used on the baseball cards). These cabinets are usually on light colored and ornately embossed mounts with his name on the bottom. 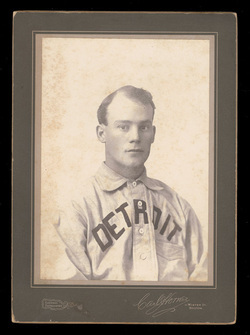 He also produced full body cabinet cards and larger mounted photos of baseball players. These are desirable, though not as rare or expensive as his "T206" cabinets. These also have his name on the mount and are ornately embossed. Horner produced some monster-sized composite baseball photographs. Made for particular leagues or teams, each photo contained many player vignettes. His name usually appears somewhere on the front. These are also rare and extremely expensive. There are early 1900s imperial cabinet sized premiums that have reproductions (photoengravings with a dot pattern in the image) of Horner's T206 images affixed to a dark colored mounts. Baseball card collectors refer to these as Horner Cabinets. A few of the images in this issue were shot by Benjamin J. Falk not Horner. Though collectable and scarce, these are not actual photographs and are to be distinguished from Horner's more expensive original photographs.